This dual function footrests works as both an ottoman and a private little cave for your pet. Relax and rest your feet while you enjoy your favorite television shows or books. It is also a great nook for your pet to also relax in. It is a great size for cats and smaller dogs. The cat ottoman footrest also works as a storage compartment. Place books, magazines, remotes and more in it. Foot rest stool is made from faux leather vinyl with a sturdy wooden frame. For added convenience, the dog house ottoman is fully collapsible for quick and space saving storage. Footstool dog ottoman is easy to set up and does not require any tools. 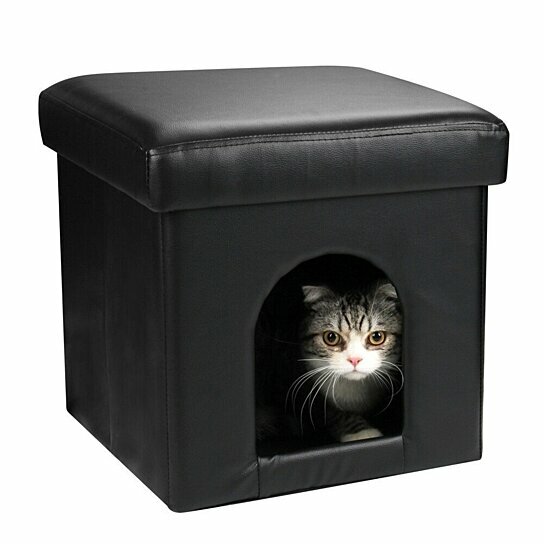 When assembled, pet ottoman house stands at 15 inches length by 15 inches width by 15 inches height.